April 18, 2019 6:00 p.m.
Silver Level $1,000 8 tickets (1 table). Recognition at the event with entrance signs and verbal recognition at the event. Listing in event program as Silver sponsor. Recognition on all take home promotions to Muscle Shoals City School students, faculty and staff (3000). 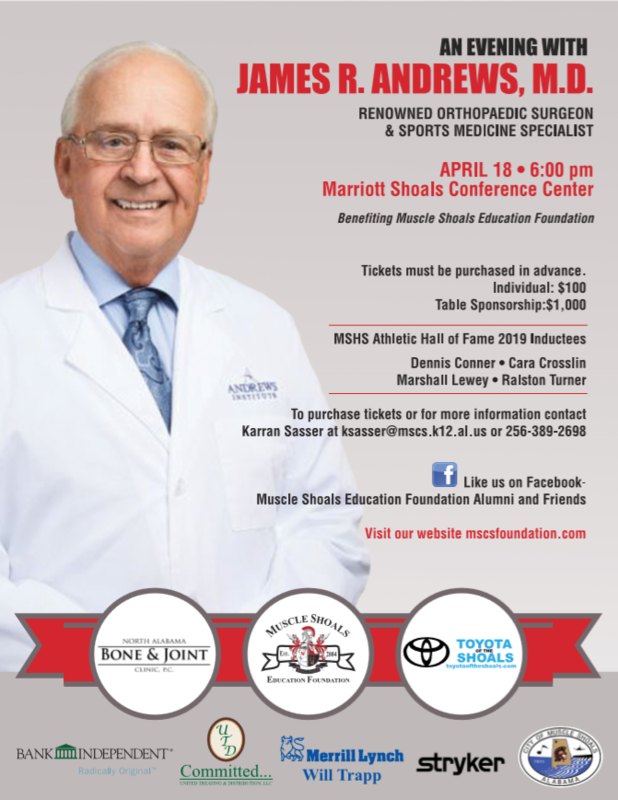 Dr. James Andrews is recognized as one of the world leaders in the field of orthopaedics and sport medicine. He is one of the founding members of the Andrews Sports Medicine and Orthopaedic Center in Birmingham and is a founding partner and Medical Director of the Andrews Institute in Gulf Breeze, Florida. Dr. Andrews serves as the Medical Director for Intercollegiate Sports at Auburn University, Senior Orthapaedic Consultant at the University of Alabama, and Orthopaedic Consultant for athletic teams at Troy University, University of West Alabama, Tuskegee University, and Samford University. He is Senior Consultant to the Washington Redskins and is the Medical Director for the Tampa Bay Rays. Dr. Andrews graduated from Louisiana State University where he was the SEC indoor and outdoor pole vault champion. He graduated from LSU School of Medicine and did his orthopaedic residency at Tulane Medical School. A native of Homer, Louisiana, Dr. Andrews has called Birmingham his home since 1986. He and his wife, Jenelle, have six children and six grandchildren.